Catskills comedy lovers lost another one of their favorites last Friday when comedian Van Harris died at the age of 88. Harris, who performed at many Borscht Belt hotels, was social director and resident comedian at the Pine View Hotel in Fallsburg for many years. Manuel Harris was born in Brooklyn to Yiddish-speaking parents, a housewife and a beverage deliveryman. He graduated from Thomas Jefferson High School and entered show business around 1945. By then he was set to marry Shirley Vinitzky. They met as youngsters and had their first date in Coney Island, on the Cyclone roller coaster. His family said Mr. Harris' decision to put family before career cost him a wider audience. But that decision kept the family close. Every summer, Van and Shirley and their four children relocated to the Catskills from their home on Merrison Street in Teaneck, New Jersey. "He was one of the last guys working the Catskills," said the couple's son, Andrew. Mr. Harris found new venues after the Borscht Belt dried up. His last gig was two years ago at an adult community in Florida. Besides his work in the Catskills, Harris appeared in nightclubs, hotels, and cabarets in New York City, Miami Beach, Atlantic City, Lakewood and elsewhere, and benefit performances in North Jersey and beyond. He also performed on The Ed Sullvan Show and Johnny Carson's Tonight Show. 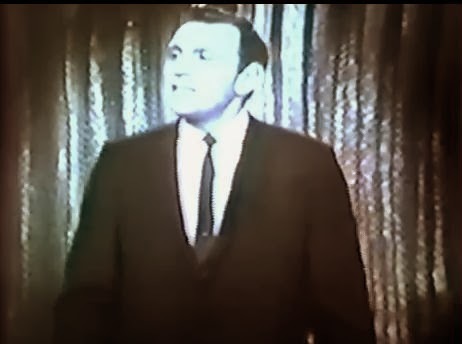 Here is the only video clip we could find of his comedy, in an appearance on the Tonight Show in the early 1960s. That is so sweet, William.